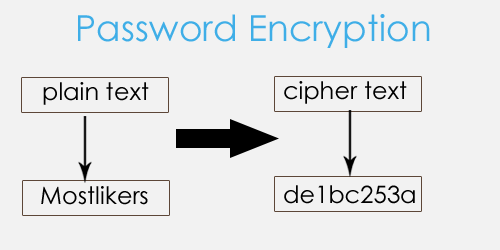 This article is about how to password encrypt method . For an overview of cryptography technology encryption function password plain-text convert cipher-text this is use of hackers cannot read our given password. the password convert to md5 algorithm this usually needs a key-generation algorithm to randomly produce keys through to store database. Password its a client request to store the database for the purpose of security. but some hackers hack to store or browser cookies password easily hack to the database. so this problem avoided to secure our password to convert hash function algorithm an MD5 (Message-Digest algorithm 5) is a widely used cryptography hash function with a 128-bit hash value to randomly generate encryption key value this value match user given password(plain text) convert to encryption key(cipher text). its very secure can't hackers hack to database store password. Actually, there are entire lists on the internet with password/encrypted md5 hashes out there. Instead, use PHP 5.5's password_* methods or for versions before 5.5, use the password compat lib.